Elmer and the Lost Teddy is about Elmer, an elephant with a multi-colored patchwork instead of the usual grey. This book, one in a series of print books that first began in 1989, is a delightful title that encourages being helpful. This book was published in print in 2005 and features illustrations that are drenched in rich colors. The story follows Elmer as he tries to find Baby Elephant's lost teddy bear. Without his Teddy, baby elephant can't sleep, so Elmer lends him his own patchwork teddy while he searches for the lost bear. Soon Elmer finds Teddy in the bushes nearby and restores the bear to its grateful owner. This digital offering is well made with simple, intuitive settings, although several links on the title page do take the reader outside of the app. Like the other titles from Oceanhouse Media, this book has an eye on educational enhancements, too. For the read-a-long effect, each word is highlighted as it is read. Tap on any word to hear it spoken, even in the 'read-it-myself' mode. The only thing lacking is a home button and page guide. Although each page is essentially a still image, many pages begin by panning over the original artwork, zooming in and out to show off each segment of text, a nice semi-animated style. For interactivity, most of the items pictured in the story react to a light tap with a visual image of the word with accompanying audio (for example, tap Elmer and the word "Elmer" appears with audio saying “Elmer”). If the image tapped is also represented in the text on that page, the word will highlight as well. Overall, this book is a delightful read and a good length for bedtime. It has beautiful illustrations and just the right amount of interactivity to inspire reading without detracting from the story. 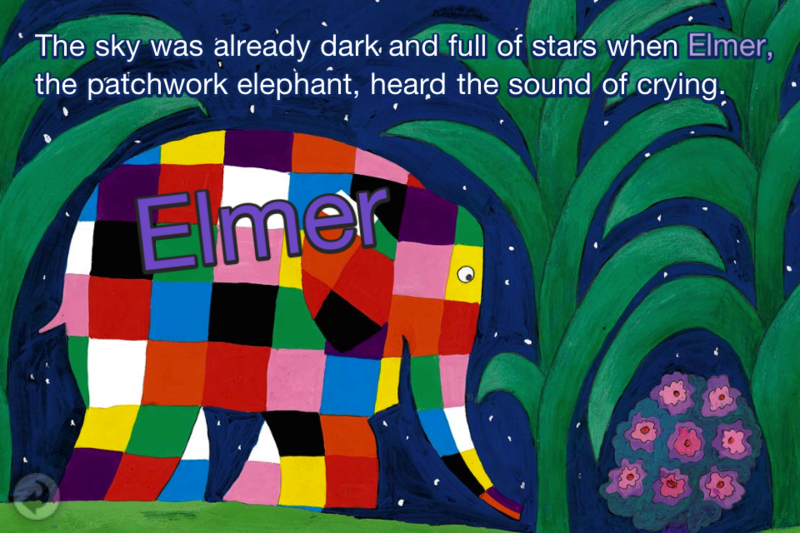 Elmer, the patchwork elephant, hears the sound of crying one night. It is 'baby elephant' who is crying for his lost teddy bear. So Elmer lends the baby his patchwork teddy. Elmer sets off the next day to try to find the lost teddy. On his journey, Elmer runs into several friends in the forest and asks them if they've seen Teddy. They all agree to let Elmer know if they find the lost bear. All the animals are pictured with teddy bears as they sleep. Then he hears a voice calling "Help!" ... and what do you know? It's baby elephant's teddy bear talking! Elmer is surprised that the teddy can talk ... but it turns out to be one of his elephant friends, playing a joke by pretending to talk for the bear. Elmer and his friend head back to the camp and reunite baby elephant with his much-loved teddy bear.